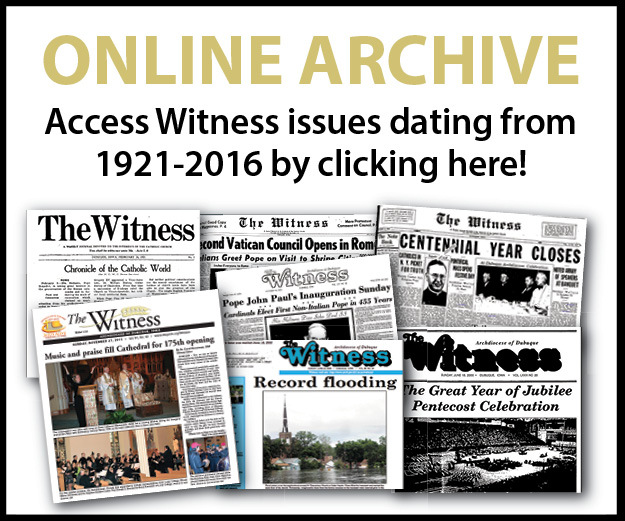 The WITNESS publishes news from the 30 county area of the Archdiocese of Dubuque covering 17,403 square miles. Major metro areas include Ames, Cedar Rapids/Marion, Dubuque, Mason City and Waterloo/Cedar Falls. We have a Catholic population of 192,374 in 166 parishes in rural areas, cities and small towns. 7,537 K-8 students attend one of 42 Catholic elementary schools and 2,123 students attend one of seven Catholic high schools. The enrollment in Early Childhood Catholic schools numbers 3,163. The Witness accepts advertising and reaches over 10,000 subscribers featuring local, national and international news dealing with social, economic and religious issues. The Witness also includes a choice of columnists, entertainment reviews and editorials.